News > 2016 > Congratulations to the 9 MBA students who won the Prix du directeur! 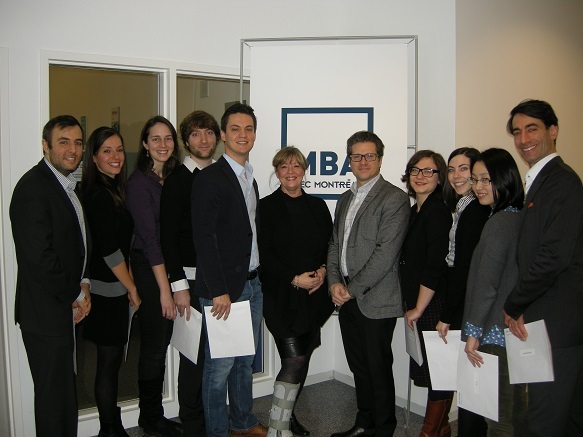 Congratulations to the 9 MBA students who won the Prix du directeur! Nine outstanding full-time MBA students earned the Prix du directeur last week, scholarships saluting their academic merit upon completion of the compulsory courses of their program. Congratulations to Ioulia Bouianovskaia, Sarah Dépont, Stéphanie Dumais, Deniz Eras, Bianca-Mihaela Matei, Vincent Rajotte, Mark-Anthony Sdao, Amaury Viairon and Sherry (Yu) Zou! Deniz Eras, Ioulia Bouianovskaia, Stéphanie Dumais, Vincent Rajotte, Amaury Viairon, Suzanne Lamoureux, Administrative Secretary of the MBA program, Louis Hébert, MBA Program Director, Bianca-Mihaela Matei, Sarah Dépont, Sherry (Yu) Zou and Mark-Anthony Sdao.